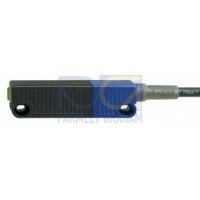 The magnetic safety sensors serve to monitor the position of sliding, hinged and removable safety guards. Sensors without integral evaluation can only be used for safety duties to DIN VDE 0660-209 in combination with a safety guard monitor for protection up to Control Category 4 to EN 954-1. The use of magnetic safety sensors is of particular advantage in cases where extremely dirty conditions can occur or high hygienic standards need to be maintained. This is provided by the simplicity of cleaning the units. A further advantage is the facility for concealed mounting under non-magnetic materials. Working surfaces and storage areas can be arranged without the need for dust-collecting edges or other functionally required cut-outs or projections. BNS range magnetic safety sensors can also be used in cases where a precise approach is not possible and greater tolerances are required. These devices comprise a multi-channel magnetic safety sensors and an actuating magnet. All magnetic safety sensors are in thermoplastic enclosures and protected to protection class IP 67 or 65.